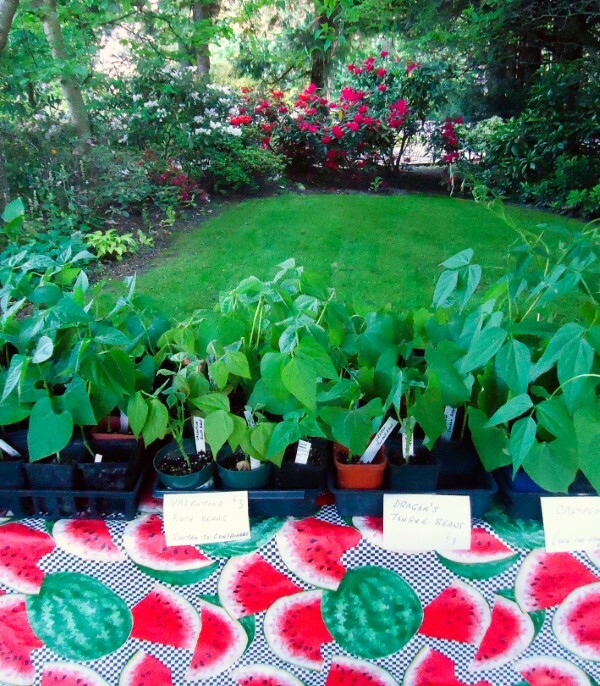 Have you ever wondered if you could start your own plant sale business? Perhaps you would like to put your green thumb to work earning some green, or want to raise money for a school or project. 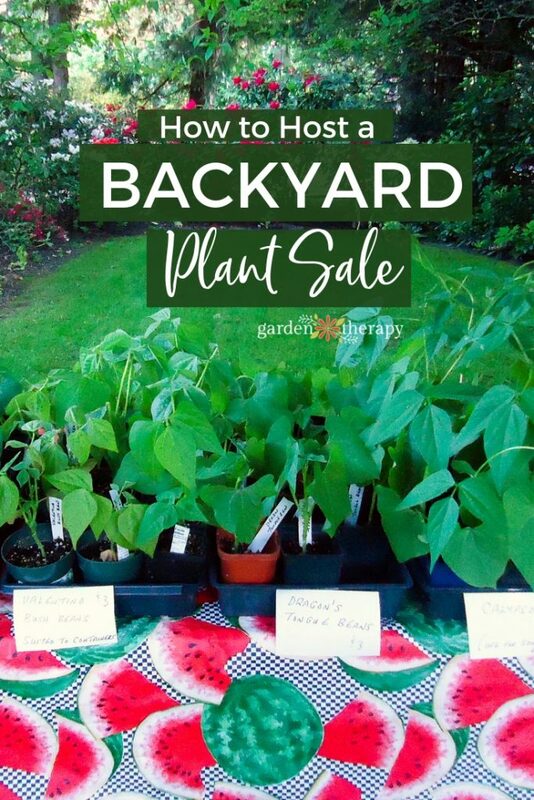 No matter what the reason, a plant sale can become a source of income while feeding your desire to garden and help the community. Read on to learn how to grow your own home-based plant business (and hop over to the Ultimate Seed Starting Guide for everything you ever wanted to know about starting seeds). Contributed my Kristin Crouch of That Bloomin’ Garden. At first, I started by growing heirloom tomatoes for my backyard plant sale. I hoped I could sell a few plants and make a bit of pocket change. Tomatoes are one of the easiest crops to grow and one of my personal favorites. I wanted to offer something different, something people couldn’t get from the local garden center. Since then I have hosted many a successful plant sale from my home and I’ve been blown away with what I’ve learned. I have been growing my own plants for over 25 years, but what I didn’t realize is how different it is to grow plants for a plant sale. Follow along with my tips for starting seeds for profit and learn whether or not it’s for you. I talked to other gardeners and made a list of what some of the most-loved tomato varieties were and used that as a guide to which seeds to buy. I was surprised that when the plant sale began, the question that was asked most was “Can I grow these in a container?” Most new gardeners live in condos or townhouses in my area, so I learned to adapt and grow to meet their needs by adding in more container varieties to the mix. I have a greenhouse that is 8’ by 20’ that had not really been used to its potential, so I had the right equipment ready to go. 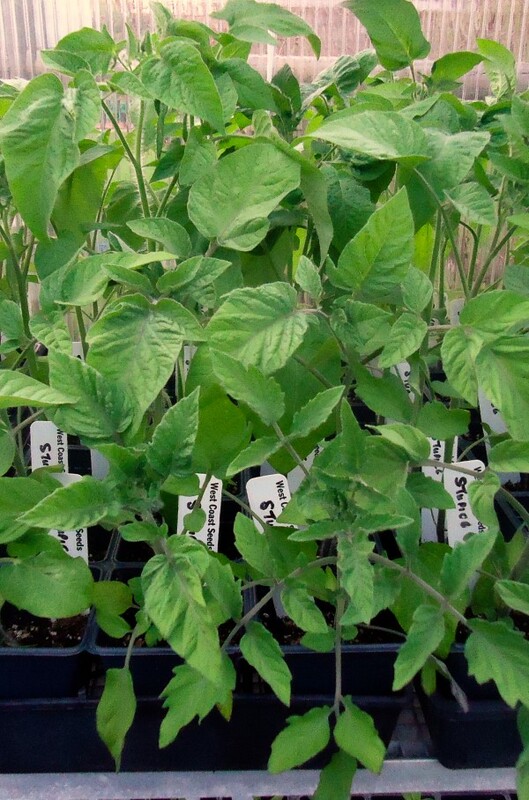 But how to go about starting seeds for a plant sale? A friend showed me what to do: start with a clean 4″ pot filled with seed starter mix and place almost a whole package of seeds in one pot! Now, you wouldn’t do it this way for home garden use because a home garden doesn’t usually require that many plants. In one plant pot I can often have between 100-200 plants germinating. Once the seeds have germinated, I transfer them up into their own pots: first, in a 2” pot, then, to their final home in a 4” pot. 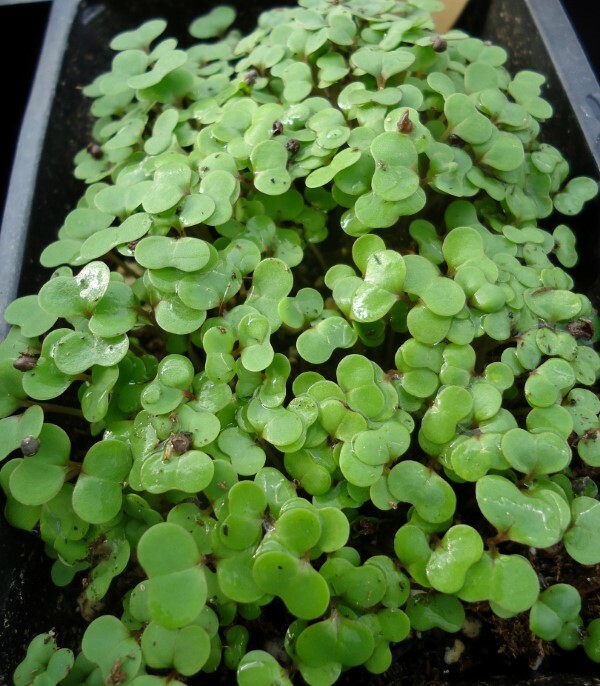 This way you will end up with hundreds of plants from that first sowing quickly and easily. I started my tomato seeds in early March and by the beginning of May they were ready for sale. If I kept them much longer I would have had a jungle on my hands! It was time for them to go to their new homes. And fast. Plan out when you want to have you sales, and work the calendar backwards to the date that you should be starting your seeds. Now I was faced with how to sell these hundreds of healthy little plants! How would I let people know? 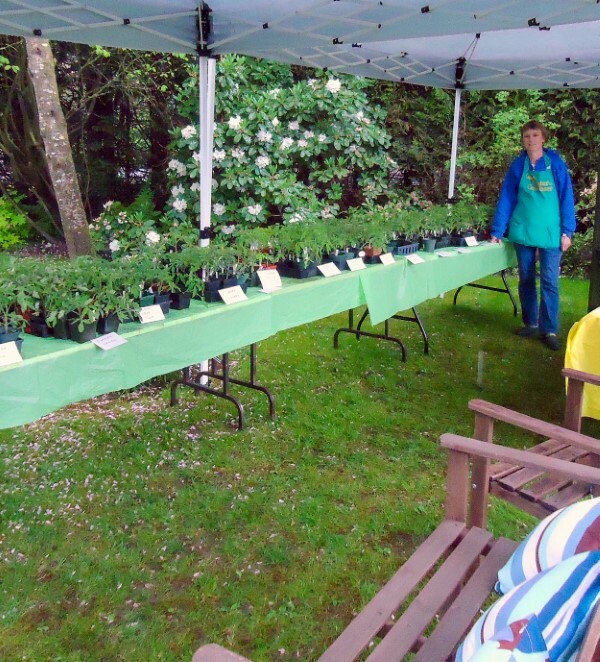 I first wrote about my plant sale on my blog which I had been writing for several years. Then, I created a poster for my sale and shared it on social media. To reach my immediate community, I joined a community-based online garage sale site, Varagesale, and posted my plant sale on it. That was the ticket to reaching my community quickly and easily. I updated it regularly with what I would be selling and answered questions. My first plant sale was a big success. I was shocked. It started at 9:00am and people arrived with their arms laden with empty flats. They left with dozens of plants on a day that poured rain. I was overwhelmed with the turnout. When it comes down to it, I am not sure I really make that much money. There are supplies to buy like soil, plant pots, labels, markers, and heating costs. Subtract those from the sales and you can calculate my profit. I don’t log the hours I spend in the greenhouse from February to April, but it’s about 3-4 hours each day. There are no days off once the plants germinate. If I am not planting more seeds, I am watering or labeling or potting up. I do this because I am passionate about growing and want to share my passion. If you are trying to earn a solid hourly rate, I’m not sure that a backyard plant business is the right choice, but if you love being out in the garden like I do, it pays you twice! 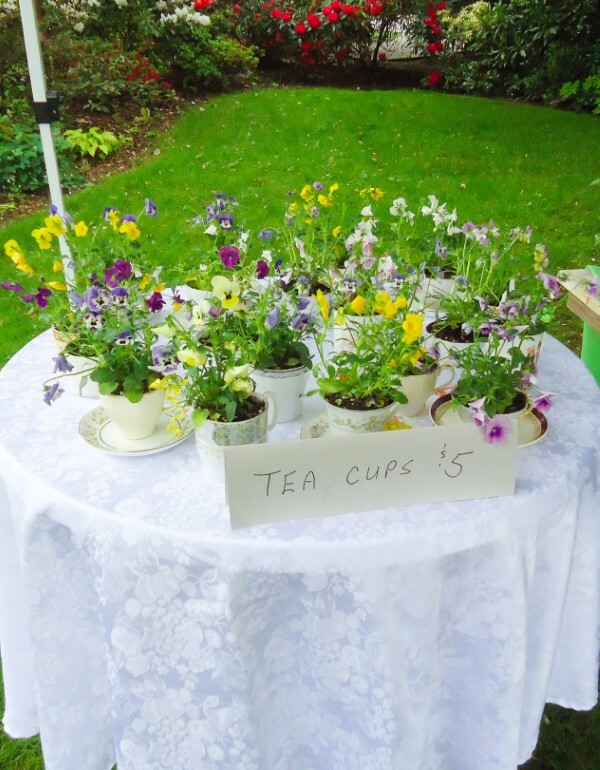 I also set up a table with these adorable tea cup planters. See how I make them here (and get some tips for using them as a fundraising tool). So what do I do with all the leftover plants? I always grow too many, and while some will be planted in my kitchen garden for personal use, the other plants are given to friends and family and to community garden members. I also donate plants to our food bank garden where the freshly harvested produce is provided to those in need. For me it’s all about sharing not only my knowledge but plants as well. At my very first plant sale I learned that people wanted education even more than the plants! I was bombarded with questions and I took the time to thoroughly answer each one of them. New gardeners need instructions and encouragement and I wanted them to be successful. When I send a customer home with new plants, I tell them to call me if they have problems. I guess that is one real benefit of being a home based-business. I like to guarantee my plants and help people learn to grow them. If one fails I can usually replace it and provide some assistance along the way. Kristin Crouch is the creator of the blog That Bloomin’ Garden. Kristin is a writer, speaker, volunteer Master Gardener, and a children’s community garden mentor. Oh, and that’s when she’s not growing 500 tomatoes in her greenhouse! Great article. I’m thinking of starting to sell some plants I’ve been growing and was wondering if you need any type of license to sell them? Have you ever had to get one? Hi Cody, It would probably be best to have a license but its a question your city hall could answer. There are many urban farmers here using their land for growing crops but the land is not zoned for agricultural use. There has been talk of licensing urban farmers as many are growing on residential and commercial land. Its a grey area for now and the city recognizes the problem. I tend to think of my sales as similar to having a garage sale. So far we haven’t needed a license for those sales. I love a backyard plant sale! Do you also sell at markets? Do you have tips for doing that? I teach a middle school gardening elective and would like to do a plant sale / fundraiser this winter and then a community plant giveaway in the spring. We have a heated greenhouse and I have experience but am wondering if you have any great suggestions for plant choice. We want to grow from seed and I have led grow lights in the greenhouse. I’m in Corvallis Oregon in the Willamette Valley Zone 8b. If you could email me directly, that would be awesome. Hi Brian, I love the idea of a plant fundraiser. Because you are growing in the winter you could think about starting some easy perennials as they take a bit longer to grow from seed. Try to look for perennial seeds that will bloom in the first year. You can also grow herbs such as chives, oregano, thyme and sage as these plants are very popular. 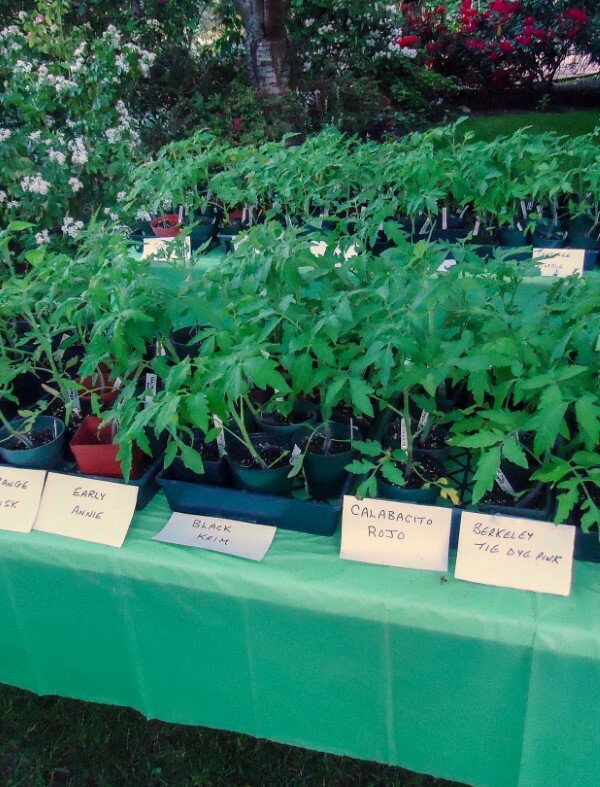 In early spring, around late February, you could start tomato plants to use for your community giveaway. Cherry tomatoes are the most popular. Take a glance at local seed catalogues with your students to see what your choices are. The hardest part will be choosing from the huge selection.